Players need to be registered by preceding Monday in order to play on Saturday. Proof of age (e.g. photocopy of a birth certificate or passport) is required for all NEW players to PYS. This will be strictly enforced. Players will be wait listed and not assigned to teams until proof of age is on file. To enter the program, players must be born prior to 7/31/2012 . Q: How big is Pembroke Youth Soccer? A: Pembroke Youth Soccer has over 1,000 players. To help support those teams we have over 150 registered adult volunteers. Q: When can my child enter the soccer program? Players born on or before July 31st, 2012, can register for soccer. A: Registration costs vary according to the age group based on costs per player. Below is the fee schedule for the upcoming season. Family Max of $365.00 excluding late fees. Late Fee is $25.00 per player. Single Season discount is $35.00. Does registering over the on line cost more? No. We offer a discount of $5 per registration for returning players who register online. New players must register either in person or by mail. They are also eligible for the $5 discount. To register with your credit card over the internet, visit Online Registration. Q: Why is there a $25 late fee after July 12th, 2015? Running a program the size of ours is hard work. We need to know months in advance of the season start date how many teams we will have so we can get enough coaches, order uniforms, register players/coaches with the state, and schedule field space. Also, a key component of a quality soccer program is an appropriate team size. We want to minimize the number of late signups as much as possible so that our team sizes are not compromised. The late fee will be waived if you recently moved to Pembroke. Q: Can a player play for PYS as well as a club soccer team? This is not a problem through the U14 age group. However, once a player reaches U16 or higher, US Soccer dual-rostering rules prohibit a player from being on more than one roster that is affiliated with Mass Youth Soccer. Teams affiliated with Mass Youth Soccer include town associations, MAPLE, NEP or any team competing for the Mass State Cup. If a club competes in the Super-Y League and also the Mass State Cup, it is OK to be rostered on a town team as well as the club team Super-Y league roster so long as you are not on that clubs NEP or Mass State Cup roster. This restriction would not apply to a U14 player "playing up" into the U16 age group. Please note that PYS also has it's own "play-up" policy. For further clarification please contact the PYS Regsitrar. Q: Can I play in Pembroke even though I don't live there? If your town offers a soccer program that is affiliated with the Massachusetts Youth Soccer Association, then you can not participate in the PYS program. If your town does not have a soccer program, then we will accept your registration and treat you like everyone else. Please contact the PYS Registrar for more information. Why do we need to show a birth certificate or proof of age at registration? Every town or club soccer program is required to validate the birth dates of the players they register. This requirement is passed down by the United States Youth Soccer Association. It exists in the interest of fair play as well as for insurance reasons. Providing false information can have serious consequences including player suspension from organized soccer, team forfeiture of any games where this player was rostered (whether or not they played), or sanctions against the club or town in which they participated. Q: How do you determine what age group a player belongs in? The cutoff date used between age groups in soccer is dictated by the policies of the US Youth Soccer Association (USYSA). This date, August 1st, indicates that a player must be under a certain age prior to that date (e.g. U10, U12, etc). For U10 and older we use two year age groupings. Our younger age groups, U5, U6, U7, and U8, use single year age groups. 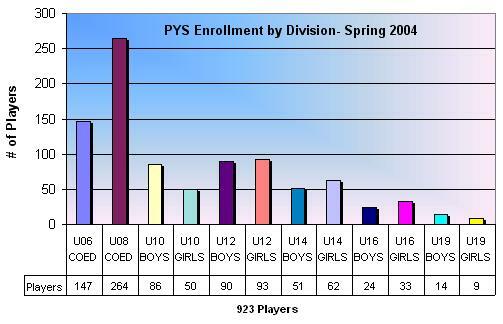 PYS allows players who are grade appropriate to "play up" into the older age group in order to play with their classmates. For parents with players who have August birthdates, all you have to do is ask. If your birthdate is after the 9/1 school year cutoff, we require proof of grade. Q: Registration can cost over $100 per player! Isn't that too expensive? PYS has to balance maintaining a quality program while still covering its costs. PYS feels its fees compare favorably to those of other towns. Many towns charge similar fees and have an additional fee for the uniform - in Pembroke it's included. Also, most towns charge separately for the Fall and Spring while in Pembroke, one price covers both seasons. PYS has never denied a childs participation in the program due to a family's financial situation. If you need financial assistance, contact the PYS Registrar (e-mail ) to see what arrangements can be made. Q: Why do I have to buy a new travel team uniform every year? Pembroke used to have a 2 year uniform policy where a uniform could be used for two years thus reducing the registration fee. This program was difficult to maintain because of issues with uniforms being discontinued and the effort involved to keep teams from having duplicate numbers. As a result, we now have a policy where a new uniform is issued every year. This policy is subject to review so feel free to attend one of the PYS Board Meetings listed on our home page and let us know how you can help. Q: Why don't travel team players get their uniform for the fall season? Travel team uniforms are needed for the spring season when Pembroke teams play other towns in the Coastal Youth Soccer League. In the fall Pembroke teams play in-town against other Pembroke teams so the uniforms would not help since everyone would be wearing the same color. It would also not be possible to issue the uniforms in the fall since the U12 and U14 teams are re-drafted for the spring season and we need to ensure that each player on a team has a unique jersey number. During the Fall season, these players receive colored t-shirts for the fall in-town season. A: Refund requests should be made to the PYS Registrar ( ). Approved requests received by July 31st will receive a full refund less a $20 withholding fee. Approved requests received after July 31st but before the second scheduled fall week will be subject to a $40 withholding fee. For players playing spring only, approved requests received by January 31st will receive a full refund. Approved requests received after January 31st but before the first scheduled spring game will be subject to a $35 withholding fee. Requests due to extenuating circumstances such as injury or ineligibility will be considered on a case by case basis and expenses paid on behalf of the player (such as uniform, leagues fees, etc.) may be withheld. Late fees are not refundable. U10s, U12s, and U14s who play in the fall only can request a $35 refund for the cost of their spring uniform provided they notify the registrar prior to November 1st.